ON LOCATION LESSON 2: I’M SO DIZZY! Sometimes in city landscapes with narrow streets, you end up shooting the scene and almost feel dizzy looking at the photos. It’s like looking up at a skyscraper from the sidewalk below. Streets and fences can also move across the frame at crazy angles. Bottom line: very steep lines of perspective are uncomfortable. The fence in the image of this barn is a good example. Hint: BACK AWAY FROM THE SUBJECT and ZOOM IN. When I back away and zoom in on my subject, note how much more comfortable the scene appears. I have a camera which has a 50X zoom capability. It’s nice in instances where I want to shoot from a distance. The advantage of doing this, when it comes to street scenes, is that it “flattens” the landscape and helps create less steep angles of recession in your perspective lines. If you paint severe perspective, the image will feel edgy. Changing your perspective to allow a bit of distance, can flatten those angles, and perhaps make the image more comfortable to look at. Try it and see if this doesn’t help your photos! “Anything but Dull” is a motto of mine. So something had to be done! If I sat on the beach, my eye (the horizon line) was even with the sides of the boats, and it didn’t make for an interesting image. I needed a different (elevated) perspective. I tried pointing my camera differently and framing the shots both in landscape and portrait compositions (as I suggested in Lesson 1 of my Painting on Location Series). That strategy didn’t change the fact that my horizon line was not high enough to see anything but the near edge of the boats. I looked around for a hill. I thought perhaps I could telephoto the boats from a higher vantage point…but there were no hills nearby. That’s when I spotted the stack of pallets on the beach! Ahhh, do you hear the choir of angels singing?? I did! I’m not sure why these pallets were stacked up on the beach, but they looked as if they might allow me to get a better perspective on my subject. Against every common sense instinct, I climbed up onto those pallets and sure enough, I had a much more interesting view of the beach! My 3-legged stool is not the most secure perch, but there it was ready for “such a moment as this”. I set up my stool on the stack of pallets, and all of a sudden it looked like a scene with elements I’d like to draw! Woo hoo! My great idea was seconded by a fellow artist on the beach. Wei Lan Lorbor carefully joined me atop the stack of pallets, (thankfully she is petite!) We laughed, but we really didn’t think much about it…after all, sometimes an Artist’s got to do what she’s got to do, right? 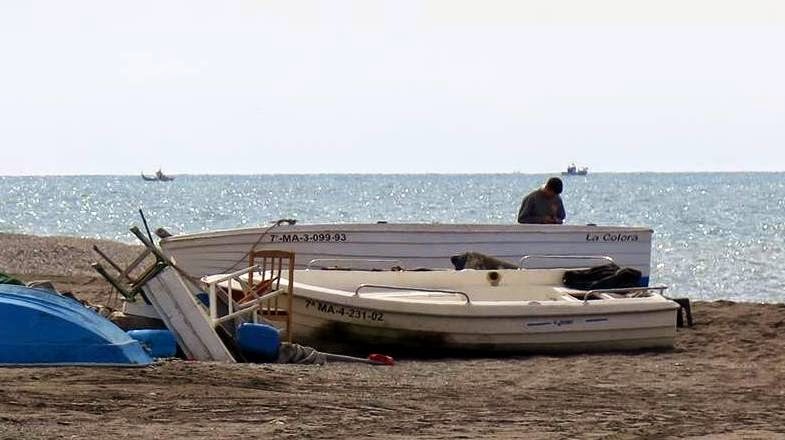 They seemed like the best seats in the house…so there we sat and enjoyed a gorgeous day on the Costa del Sol of Spain. It doesn’t get any better! Hint: Photograph your subject from wherever you draw it. When you draw or paint on location: DON’T FORGET TO TAKE A PHOTO FROM WHATEVER VANTAGE POINT YOU SETTLE ON. THIS WILL RECORD THE SCENE FROM YOUR PERSPECTIVE AND ALLOW YOU TO HAVE A GOOD REFERENCE IMAGE IN CASE YOU WANT TO COMPLETE THE PIECE LATER IN THE STUDIO (or in case it rains, or you have a sudden cappucino craving). I got off the pallet stack and made my way back to the café, where other (possibly smarter) artists from our group were happily painting in the shade and drinking cappucinos. I was hot and thirsty and a little stiff. Though I was happy with my drawing, it was pretty apparent that these smarty-pants in the shade of the café truly had THE best seats in the house. In fact, they had found inspiration for their paintings in the view of our backsides. Look what Karen Knutson came up with…isn’t it fun?! 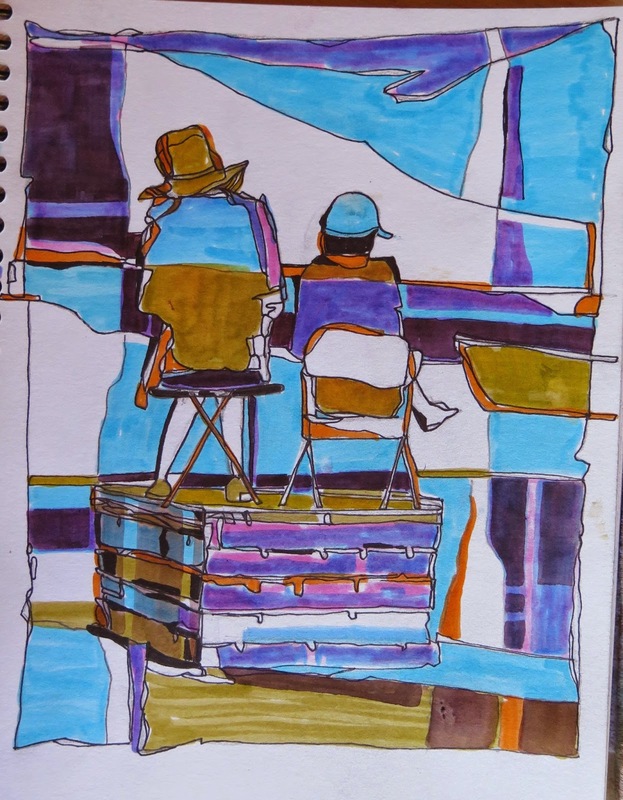 “Best Seats in the House”- sketch by Karen Knutson- Tombow markers on paper. Love it! 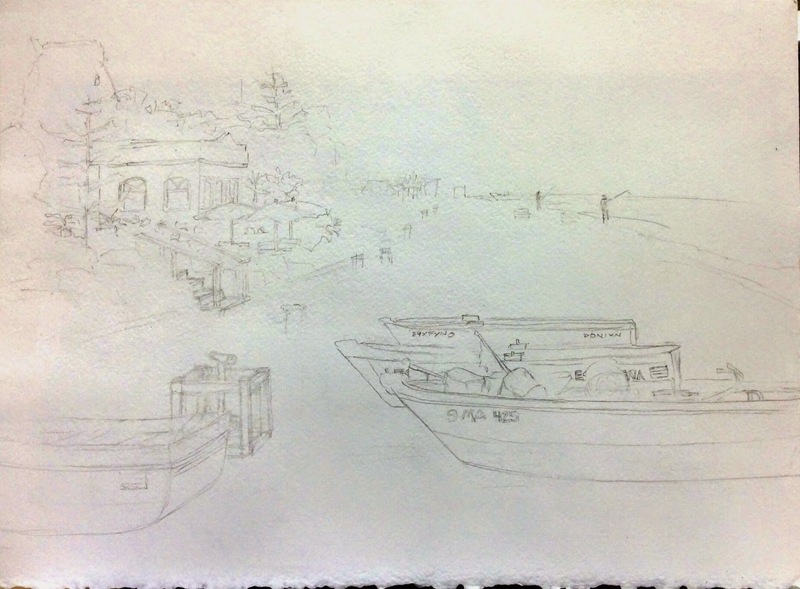 I didn’t come away with a great painting that day, but I had an experience and a drawing…and a story! Sure it’s not always comfortable…and you don’t always come away with a masterpiece…but you make a memory. In some ways painting on location is like camping; not always a simple or comfy, but there’s joy to be had in overcoming the obstacles, and some experiences can only be had out in the open and on site. That’s what I love about Plein-Air painting…the memories and the experiences. My drawing and photos from that day allowed me to come up with this little painting once I got home. A happy momento of my visit to Benajarafe on the Costa Del Sol. The painting above was completed in the studio. The image is entirely based on elements drawn from the beach. Their locations and the time of day are “imagineered” by me, but it’s still an homage to my time on that beach. So fun! If you haven’t tried painting like this, I encourage you to give it a go…Take a hat, perhaps a small stool, paper, pen, pencil, eraser, some kleenex, and a camera. Don’t worry about doing a finished masterpiece. My goal is simply to capture elements from the scene which are impressions of my experience there. Give it a try and report back! Not sure what to bring? My complete Supply list for Travel is near the calendar here on the homepage of my website. Let me hear from you! I read every comment and it means a lot to know you are out there reading. Great post, Rebecca! I remember that day. Have a great trip to Tuscany! Thanks Kathie! Yes, it was a fun day in Spain wasn't it? Loved sharing that trip with you. I know you're off on another adventure to France and Le Vieux Couvent…ahh I can just taste it! Have a wonderful time yourself, and I hope we can travel together again soon!